The weighted average gold grade of the stope drifts measures 13.30 g/t gold or 58% higher than the proven and probable mineral reserve grade of 8.4 g/t gold for the Buriticá project. 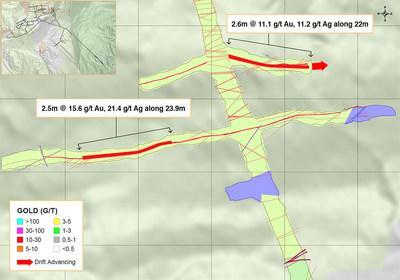 Remarkable continuity and consistent gold-grades were observed in all stope development drifts, with total drift sampling measuring 429 metres of strike length. Lateral underground development for the project continues to be ahead of schedule, with 959 metres completed in February against a plan of 868 metres. TORONTO , March 5, 2019 /CNW/ - Continental Gold Inc. (TSX:CNL; OTCQX:CGOOF) ("Continental" or the "Company") is pleased to announce high-grade assay results from 12 stope development drifts as part of the underground construction at its 100%-owned Buriticá project in Antioquia, Colombia . Development of the Buriticá project remains on schedule with first gold pour anticipated in H1 2020. Supporting information for results discussed in this release can be found in Figures 1, 2, 3 and 4 and all sampling widths reported herein are at true horizontal metres. "It is a very exciting time for Continental Gold as we are now drifting along high-grade mineralization in both the Yaraguá and Veta Sur systems that we plan to mine by longitudinal long-hole stoping beginning in 2020," stated Ari Sussman , CEO. "With underground development remaining well ahead of schedule, we are confident that extra time available for pre-production stope preparation will provide the Company with a buffer of excess material to feed the plant on planned start-up of commercial production next year." Notes: Based on cut-off grades of 3.8 g/t for Yaraguá and 4.0 g/t for Veta Sur, $950 per ounce gold price, and US$:COP exchange rate of 2,850. Rounding of some figures may lead to minor discrepancies in totals. Source: "Buriticá Project NI 43–101 Technical Report Feasibility Study, Antioquia, Colombia" dated March 29, 2016 with an effective date of February 24, 2016, led by independent consultants JDS Energy & Mining Inc.
Donald Gray , COO and a Qualified Person for the purpose of Canadian National Instrument 43‑101 ("NI 43‑101"), has prepared or supervised the preparation of, or approved, as applicable, the technical information contained in this release. Channel samples are taken continuously along the walls of the underground cross-cut and across the face of the underground drift. Faces are nominally spaced every 3 metres along the drift, and face composites average six length-weighted channel samples. Widths are true horizontal metres at 0 g/t gold cut-off grade and no capping has been applied to sample composites. Partial results for stope areas 8-12 were announced on January 15, 2019 . The Company utilizes a rigorous, industry-standard QA/QC program. Rock samples have been prepared and analyzed at Continental Gold's Yaraguá mine laboratory at Buriticá, Colombia . Blanks, duplicates and certified reference standards are inserted into the sample stream to monitor laboratory performance. Crush rejects and pulps are kept and stored in a secured storage facility for future assay verification. Although historic correlation between analytical results from the Company's internal laboratory and certified independent laboratories for gold and silver analysis have been within acceptable limits, the Company's internal laboratory is not independent or certified under Canadian National Instrument 43‑101 guidelines ("NI 43‑101") and, as such, results in this release should only be taken by the reader as indicative of future potential.